What does it mean? Whoever you talk to- a friend, spouse, family member or a co-worker, 95% of the time, they will agree with whatever you have to say regarding a personal matter that’s going on in your life. Some advice may be a little too over the top, and others may be generalized for the sake of staying neutral, but overall, you’ll come to notice that the advice you get from the people closest to you will deter you from making a conscious and wise decisions of your own. Influences. People who are close to us have the influence to persuade us one way or the other. Sometimes, people do it out of self-gratifying reasons. Sometimes, you have to ask yourself, does this person want something out of this? What would he/she gain if I told them this, or got advice from them about that? Does this person have a romantic interest in me? Or is this person jealous of the relationship I have with whomever I’m having the problem with for whatever reason? How do you determine what’s “good advice”? What may be good for me may not be good for you. So who’s to say what’s “right” and what’s “wrong”? Look at psychiatrists. They don’t give their opinions. Did you ever think why they never give their personal opinions on a matter that’s important to you? They want “you” to figure it out on your own. Only “you” can make a decision that’s important for you- a decision that’s healthy for you. Somebody may think ‘this is the healthier choice’, when in fact, it may be just the opposite. I remember sitting in my shrink’s office getting so frustrated with him. I never understood it, until I looked around my environment and discovered that there are way too many opinions being flung over the fence for free. Life’s one big puzzle. Doctors are there to help us figure things out- to push us along. Then I have another theory: conflicting viewpoints that help with our growth in dealing with people, adversity and understanding. If you can manage to have a healthy debate, you can learn a lot of things. If you can maintain a level of calmness while in a disagreement, you can be reassured you’ll learn something from it all. Going back to the influences of people and their advice—if I went by my mother’s advice, I’d be married to a “rich Jewish man” with a ton of kids by now. But, that’s not happening obviously. My conscious decision is to be with who I “love”—not for money or for reasons that are most acceptable to society. I truly believe that in certain situations, when mothers give their children advice, it’s for a self-gratifying nature. Their little girl is off to do something that wasn’t what the mother had planned. I’m not saying “all moms” do this—but the majority sometimes overwhelms their children with advice and suggestions that go with what ‘they wanted out of life’…not what their children wanted. And that’s normal. They care and want the best for their children. But, what’s the definition of “the best” to the parent? Naturally, when a parent stifles their child with strict rules, forced religion and decisions that are only made by that parent, for the sake of ‘keeping them safe’ (and I speak of strict rules in the terms of “YOU MUST BE CHRISTIAN” or “YOU MUST MARRY A MAN”), the child ends up doing the very opposite sometimes. And at times, we get advice from family and friends that tell us, he/she is no good for you. Move on. Get rid of him/her. They’re not good enough for you. 9 out of 10 times, the person getting the advice who takes the advice will soon regret it, depending on their situation. They didn’t think for themselves. They didn’t listen to their own heart. Their conscious decision was the very opposite of the advice that was given to them. Discernment. Learn to decipher who is telling you genuine heartfelt advice, and who’s talking your ear off just to gain some sort of self-gratifying need from you and your situation. There’re too many yentas out there flapping their gums talking about who did this and who did that. Washwomen if you will... It’s sad, because usually these types of people have nothing better to do, because there is nothing exciting going on in their own lives. They need to meddle in yours. 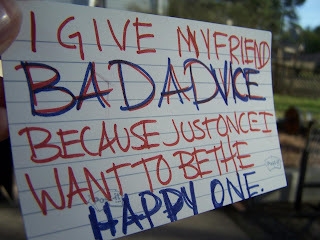 So sit back and let the gossip and bad advice go in one ear...and out the other. Listen to your heart and what’s best for “you”. For me, if I have questions about life and my personal decisions, the best source is going straight to the top: God.